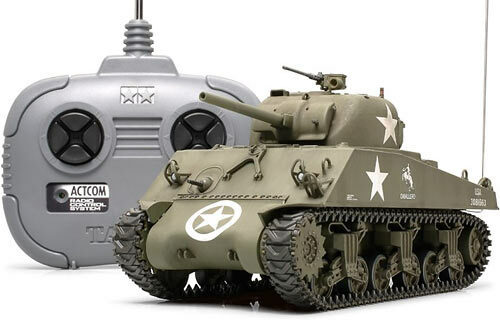 Tamiya make excellent radio-controlled tank kits; I have two. Their 16th-scale kits all cost several hundred dollars, though. ...is one that should be well under $200, delivered. It's the upcoming #48207 Sherman, a reduced-size version of the 16th-scale Sherman that Tamiya have been selling in different versions, on and off, for decades now. This Sherman is 1:35th scale, an immensely popular scale for military models, so it ought to be about 16.7 centimetres (6.6 inches) long. 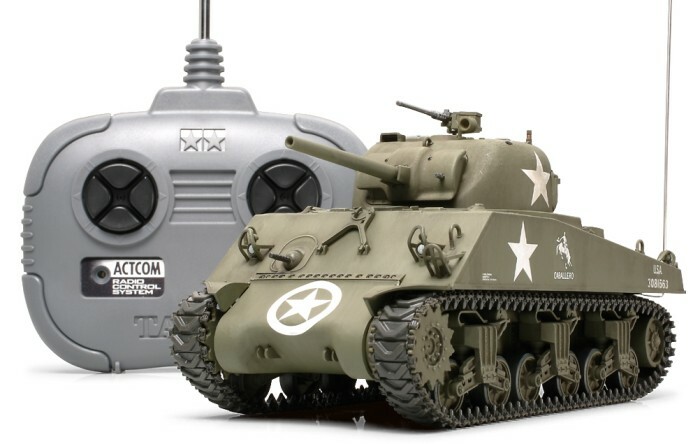 And, like the 1/16th Kubelwagen Tamiya sold a few years ago, the 35th-scale Sherman comes with radio gear. It's still a proper R/C kit that needs to be assembled and painted, so yes, there's more to buy. But you have to buy at least a radio set for a normal R/C kit; the 35th-scale Sherman has one in the box. And its major electronic and mechanical components seem to come pre-assembled. You shouldn't need anything but basic hand tools and glue to build it, actually, if you're happy with whatever colour the parts are when you snip them off the sprue. The list price for the new Sherman is $US213 or something, but list prices for R/C kits are always ridiculous; you shouldn't find it actually costs more than about $US150 from a hobby shop. As I write this, HobbyLink Japan (with whom I do not, in case you were wondering, have an affiliate deal) have the new Sherman available for pre-order for only 13,110 yen (that's about $US124, $AU150 or 85 Euros, as I write this). That doesn't include delivery, but this isn't a big kit; it shouldn't cost more than another 5000 yen to ship anywhere in the world. So the total should come in well under $US200. The pre-order price is a 5% discount on the 13,800-yen normal price. The kit's slated to be in stock in mid-October. Tamiya have made several other 35th-scale R/C tanks, but in their typical treat-customers-mean-keep-'em-keen fashion, you're not going to find most of those kits in the shops any more. They released two other 35th-scale R/C tanks this year - a Panzer IV and a Panther G - and you may just still be able to find those for a reasonable price. These current 35th-scale tanks are more expensive than the ones that were on sale a few years ago, but that's because they've got turret traverse and gun elevation. I think they have proper articulated tracks, too, not unrealistic and power-sapping rubber belts. If the above-pictured Sherman has rubber tracks, they're incredibly detailed, with proper sprocket drive. You don't get sound effects or flashing "firable" guns, but you do get a lovely scale model with full Dalek motion control. What's not to like? « Never mind the quality, feel the price!